Crown Propeller’s blog is proud to present rare memories of a jam session featuring Milt Buckner. Pianist, organist and vibraphonist Milt Buckner (1915–1977) spent a large part of his later years in Europe, touring throughout the continent, often playing with local rhythm sections and happily allowing local players to sit in. On one of his concerts which took place on January 4, 1977 at the Jazztone in Lörrach on the german side of the swiss-german border not far away from Basel, Buckner was joined by pianist Jules Plattner, bassist Rolf Winiger and drummer Georges Bernasconi– the last named having recorded with Buckner before. Joining the band for part of the evening was swiss alto saxophonist Mario Schneeberger. at the Jazztone in Lörrach, January 4, 1977. Otto Flückiger is sitting in the front row, turning his head. 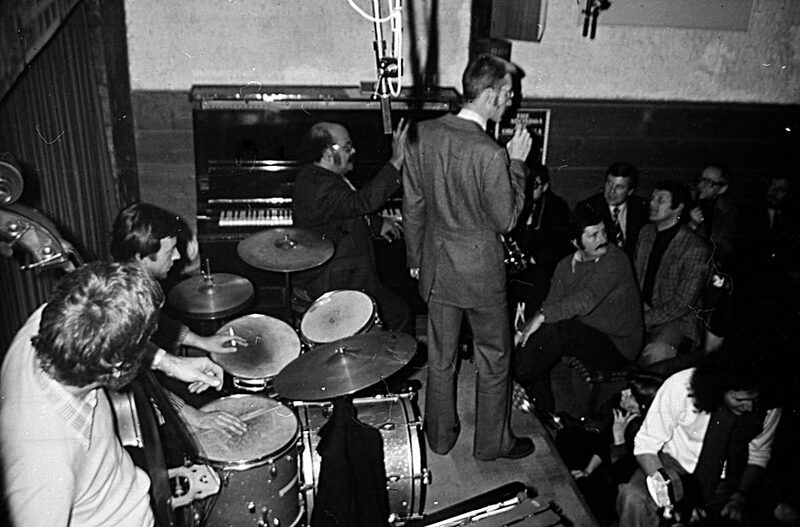 Being a friend of Mario and a fan of Milt Buckner, the late swiss jazz researcher Otto Flückiger was at the Jazztone that night and recorded the event. Otto can be seen in the audience on some of the shots that were taken by an unidentified photographer. I am thankful to Mario for allowing me to publish tracks from that evening on which he himself is heard (excepting those which are of a not too good quality). If you know who took the photographs in this post, please let me know, as I prefer to give proper credit. To enlarge the photographs, please click on them. Two weeks ago I spend an evening at the monday meeting of the Jazz Circle Zurich, where Mario Schneeberger was giving avery interesting lecture on the 1953 Lionel Hampton Tour and playing a lot of commercially unissued tracks from that tour. As some may know, Mario is not only a fine jazz researcher (he contributed a lot to the 1946 Don Redman tour page), but also a very fine alto saxophonist (Mario used to be called “Little Bird” by his friends). Mario was a close friend of deceased jazz researcher Otto Flückiger, who always took his camera with him when Mario was playing somewhere close. And Otto also had befriended Elmer Gill (1924–2004) who, born in Indianapolis, later settled in Seattle and Vancouver. Gill – who is mostly known for having played with Lionel Hampton’s orchestra in 1952 and 1953 – in the 1980s and 1990s could often be heard in switzerland. And on some of this occasions Mario Schneeberger took the opportunity, to sit in with the band. As I had promised in this post to bring some more about Elmer Gill, i have just put up two clips with Mario and Elmer filmed by Otto on different occasions. First here is Mario sitting in with the Seattle Reunion Quintet at the “Birdland” (in fact the Restaurant Fasan) in Emmen, Switzerland on May 5, 1992. The Seattle Reunion band consisted of veterans Elmer Gill (p, vib), Jabbo Ware (ts), Floyd Standifer (tp), Buddy Catlett (b), and Patty Padden (d). On “Cherokee”, which I am presenting you here, Jabbo Ware does not play. The second clip was filmed five years later at the Ortsmuseum (Local Museum) in Zollikon, Switzerland on January 12, 1997. Otto had curated an exhibition about the history of jazz at the museum and this concert was part of the program. Here Mario is playing “Perdido” with Elmer Gill’s trio which consists of Elmer (on a Roland piano), swiss bassist Vince Kummer and (Elmer Gill’s son) Donald Gill on drums.